Rights and Wrongs. Two Photos, Two Stories. Justice and Injustice. Nepal | United We Blog! Which brings us to the second photo that we are discussing in this post. The pair of Ganga Maya Adhikari and Nanda Prasad Adhikari beg to disagree with Ghimire’s concluding remarks to the reporter. The Adhikari pair, at the time of writing this entry, is lying on beds in the Intensive Care Unit of Bir Hospital. Their health condition has deteriorated. There has been an outcry against the government’s apathy. People are demanding that their lives be saved. The pair has been staging a hunger strike since 12 August, seeking justice for their son Krishna who was murdered by the Maoist cadres during insurgency. That Maoist cadre could be any Maoist cadre including Pawell who will soon be designated Lieutenant Colonel at the Nepal Army. Or, Pratiskhya aka Yam Bahadur Adhikari, for that matter, who will be the most senior former Maoist guerilla to be integrated into Nepali army as Colonel. One wants to forget the past (For him: Past is Past). Another is thankful to the past. And rightly so. Because of what they did in the past (including killing many like Krishna), they are now colonels, majors, captains and lieutenants in the national army. But what have Adhikari pair got? The country is in a very precarious situation now- non-violent Gandhian movement and voices go to deaf ears. Just look at the uncomfortable situation the Supreme Court is at the moment. There’s a case against it’s boss, Chief Justice who also happens to be the Prime Minister (Chairman of the Council of Ministers). The court keeps on differing hearing on the case. A farce and a sham. Mockery of justice, to say the least. And the man himself is totally at the mercy of the man who stands over the corpses of 16,000 people. To say that the peace process is over is akin to claiming that Nepal is now a developed country. Peace process is far from over. Just because some Maoist guerillas are integrated into the national army doesn’t mean Nepal can celebrate the return of peace. Of course, the Maoist leaders who led the decade-long killing spree in the name of overthrowing parliamentary democracy in Nepal want to dismiss and forget the bloody past and move ahead (on the tactical path of ‘competitive democracy’ and aiming to establish, ultimately, the dictatorship of proletariat (or, Prachanda). That’s why the Maoist supremo, Prachanda, keeps on saying that no conflict-era cases should be investigated. But, as I noted earlier, Adhikari couple beg to differ. They cannot forget the past. They want justice. And they are not alone. Take, for example, this tweet from journalist Girish Giri whose father was murdered by the Maoists. The point is- Truth and Reconciliation Commission is yet to be formed. This, despite the fact the President has already ordained the Truth and Reconciliation Act. In principle, the Act is in effect. But in practice, that Act is nonexistent. Some rightly say that the Act is actually toothless. But silence will not strengthen the Act’s teeth. The international community that gets agitated by smallest of the happenings in Nepal is opting for a deplorable silence on the case of Adhikari pair. Fair probe sought into Adhikari killing: The Conflict Victims National Society today demanded that the government take stern action against culprits of the June 6, 2004 murder of Krishna Prasad Adhikari. “The government should conduct fair investigation of the murder and do justice to the victim’s family without further delay. We would also like to appeal to the concerned authorities and human rights activists to take the initiative to save the life of the deceased’s father Nanda Prasad Adhikari and Ganga Maya who have long been staging hunger strike demanding action against the murderers of their youngest son,” a press release issued by Kul Bahadur Gurung, former speaker of the Constituent Assembly on behalf of CVNS said. Krishna Prasad, a resident of Phujel VDC, Gorkha, was kidnapped and subsequently murdered by Maoist fighters in Chitwan. Their party had also claimed responsibility for the murder at that time. Maoist cadres had killed Adhikari in Chitwan on June 6, 2004. Nanda Prasad and Ganga Maya have been staging a fast-onto-death from the bed of Bir Hospital for three weeks. According to doctors, their health condition is getting worse with each passing day despite medical treatment. “Maoists are trying to shield the culprits. They have not even shown compassion for the agitating couple who lost their teenage son,” the release added. It also condemned the recent remarks of UCPN- Maoist Chairperson Pushpa Kamal Dahal, who warned the government against proceeding with investigation into the murder. Adhikari couple urged to end hunger strike: Aug 28: Stating that the government has already initiated investigation into their son´s murder, human right activists have appealed Nanda Prasad and Ganga Maya Adhikari to break their hunger strike without delay to prevent their health from deteriorating further. With their health in a very critical condition, the couple is in the intensive care unit of Bir Hospital since a week. They have been on fast-unto-death for over a month demanding action against those involved in the murder of their son Krishna Prasad Adhikari. He had died at the hands of Maoists during the insurgency. “The government has officially informed us that an investigation has been initiated. In such a condition, we strongly appeal Adhikari couple to call off their hunger strike,” said Gauri Pradhan, commissioner and spokesperson of National Human Rights Commission (NHRC). 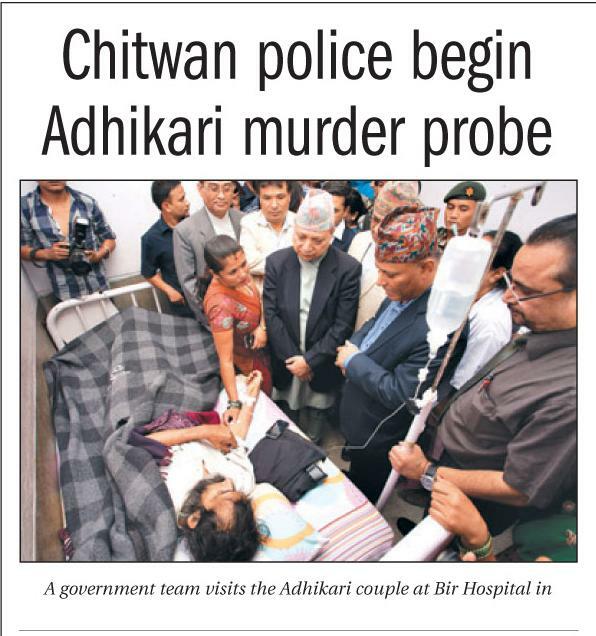 Responding to the mounting pressure from all quarters, the government had directed Chitwan Police to reopen the case three days ago. Krishna Prasad was killed at Ratnanagar of Chitwan on charge of spying against Maoists, then a rebel force fighting the government. “They have refused to eat anything until action is taken against those involved in the murder. However, we would like to assure the couple that they should wait and see for now as the government has ordered investigation into the matter. As their health is already in a very critical condition, it would not be wise to be stubborn. They need to be alive to fight for justice,” said Pradhan. Previous PostPrivileged Maoist Kids and the Unfortunate Lot Who Were Forced Out of Schools by MaoistsNext Post७१६ जना = एक गैससः नतिजा खोई?